[PDF] Encyclopedia of Disasters [Two Volumes]: Environmental Catastrophes and Human Tragedies | Free eBooks Download - EBOOKEE! Posted on 2017-10-23, by luongquocchinh. Description: Grade 9 Upâ€”Gunn catalogs 184 natural and human-induced disasters chronologically, beginning with an Indonesian volcano in 74,000 BCE and ending with a 2007 tornado in Greensburg, KS. Articles, varying in length from two paragraphs to several pages, include some well-known and absorbing accounts. For instance, the one on the 1932 Soviet forced famine in Ukraine discusses Stalin's wife's connection. Other entries are more obscure, such as one on a hurricane that struck Georgia and South Carolina in 1881. Unfortunately, the depth and quality of the entries are mixed. Some articles discuss other events at length. Half of the entry on a 1960 mid-air collision over New York City, for example, digresses to Swissair's 1998 plane crash in Nova Scotia. The further-reading resources following articles are dated. Those listed for a 2005 earthquake are from 1950, 1974, and 1993. The writing style of the lengthy introduction is inconsistent and shifts between informal first person to more scholarly third person, and between passive and active voice. Questionable information is provided as fact with no documentation ("Our rate of consumption of almost all natural resources has dropped greatlyâ€¦we consume less of irreplaceable oil and gas supplies."). Few of the mostly small black-and-white photographs provide any real impact or new information. The index (in volume two only) fails to list some of the principal figures mentioned in the articles. There are only a few cross-references and alternative spellings are disregarded. 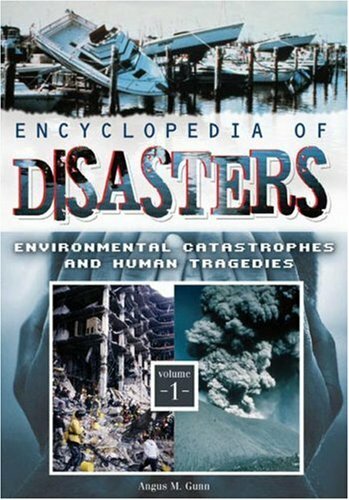 2011-09-15Encyclopedia Of Disasters: Environmental Catastrophes And ..
2010-02-28Encyclopedia Of Disasters: Environmental Catastrophes And ..
2010-02-02Encyclopedia Of Disasters: Environmental Catastrophes And ..
No comments for "[PDF] Encyclopedia of Disasters [Two Volumes]: Environmental Catastrophes and Human Tragedies".